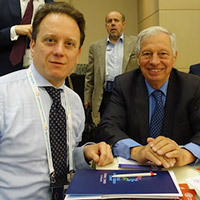 Oreste Foppiani, associate professor and International Relations department head in Geneva, and Michel Veuthey, associate professor of international law and vice president of the International Institute of Humanitarian Law, and Deputy Permanent Observer of the Sovereign Order of Malta to the UN Office in Geneva, participated in and spoke at the UN World Humanitarian Summit in Istanbul, Turkey. Foppiani and Veuthey participated in several high-level meetings such as that on “Upholding the Norms that Safeguard Humanity,” and special sessions such as the one on “Migrants and Humanitarian Action” and another on “Humanitarian Principles,” where they could express their views on some specific themes and issues, which represent the main concerns of heads of state and government all over the world. Additionally, they participated in noteworthy side events organized by the Organization for Economic Cooperation and Development (OECD) and the German Federal Ministry for Cooperation and Development (BMZ), by the American Red Cross, the IFRC and the ICRC, and by the Norwegian Ministry of Foreign Affairs. They were among 80 academics invited by Stephen O'Brien, the UN Under-Secretary-General for Humanitarian Affairs and Emergency Relief Coordinator. Included in their work were commitments of professors and researchers in the humanitarian field with contributions from Foppiani, as well a report on the WHS by Veuthey. Read more and find links to those reports in this story at Webster Geneva.